Growing up in New Jersey just one hour outside of New York City shaped my entire view of ‘what a city should be’ for the rest of my life. There is nothing like Manhattan — the energy, the excitement, the pace, the opportunities for food, culture, and visual stimulation. But all that fast paced action can be a bit much sometimes. New York’s huge Central Park is an amazingly beautiful sea of green space in the middle of such a bustling city. I’ve always thought of it as a great oasis of nature and calm right in the heart of the city. On any NYC visit, it is a top must-see. The massive 843-acre park opened in 1857 and receives about thirty-five million visitors each year. You can find everything here from sprawling waters and green meadows to stunning bridges and live theatre, plus educational facilities, gardens and even classical architecture. Here are just a few off the many amazing attractions. The Mall is the only straight line in the Park and is one of Central Park’s most photographed areas. The gorgeous American elm trees form a cathedral-like canopy above the Park’s widest pedestrian pathway. Taking care of all the wonderful trees in the park is a full-time job for the Central Park Conservancy’s tree crew. Each of the park’s thousands of trees are entered into a database, so they can be monitored. The trees of Central Park have an important impact on the urban environment as they improve the quality of New York City’s air and water; reduce storm water runoff, flooding and erosion; and lower the air temperature in the summer. This is why Central Park is called the lungs of the City. The southern end of the Mall is known as Literary Walk with several large statues here depicting prominent writers. Although these days you’ll mostly find sunbathers lounging on the lawn, the aptly named meadow was actually home to a flock of sheep from 1864 until 1934. In the 1960s and 70s, thousands of people came to Sheep Meadow for large-scale concerts. Even the first landing on the moon was televised to a crowd at the Meadow on July 20, 1969. Today, the meadow is a park Quiet Zone — which means it’s the perfect place to relax and unwind. The Sheep Meadow attracts thousands of visitors, who gather to sunbathe, picnic, fly kites, and enjoy this 15-acre pastoral escape — free from the hustle and bustle of New York City. A beautiful lake set in the most unexpected of locations, the Reservoir is ringed with a track popular with joggers, walkers, and cyclists. It is 40 feet deep and holds a billion gallons of water and was built in the 1860s as a temporary water supply for New York City, while main water system was shut down for repairs two weeks each year. Going for a skate in the park each winter is a tradition for New Yorkers and tourists going back more than a century. This public ice rink sits in the southern corner of the park right near 5th Avenue. The current rink opened in 1949 and is usually open for ice-skating from October to April. In the summer, it transforms into a venue for other purposes. This small 6.5-acre zoo welcomes nearly 1 million visitors annually who come to see the diverse collection of animals that call the Central Park Zoo home. Animals have lived in the area around the Central Park Zoo since the 1860s, but the current Central Park Zoo has been open only since 1988. The Central Park Zoo is home to a variety of animals, including seals, sea lions, penguins, snakes, bugs, monkeys and birds. Meaning ‘beautiful view’ in Italian, Belvedere Castle was created in 1869 as one of its many whimsical structures intended as a lookout to the reservoir to the north (now the Great Lawn) and the Ramble to the south. Belvedere provides the best and highest views of the Park and its cityscape. This 2.5-acre memorial is dedicated to the memory of musician John Lennon and is named after The Beatles song “Strawberry Fields Forever”. Countries from all around the world contributed trees and Italy donated the iconic “Imagine” mosaic. The entrance to the memorial is located on Central Park West at West 72nd Street, directly across from the Dakota Apartments, where Lennon had lived for the later part of his life, and where he was murdered. The gorgeous focal point of the Bethesda Terrace, the Bethesda Fountain is one of the largest fountains in New York. It is one of the most well-known fountains in the world, and the statue at its centre was the only sculpture to have been commissioned as a part of Central Park’s original design. Of course, above all things, Central Park is a park, so there are plenty of attractions that focus on physical activities and other fun pastimes. Two skating rinks, a carousel, a public swimming pool, baseball fields, tennis courts and other sport attractions are scattered throughout the park. 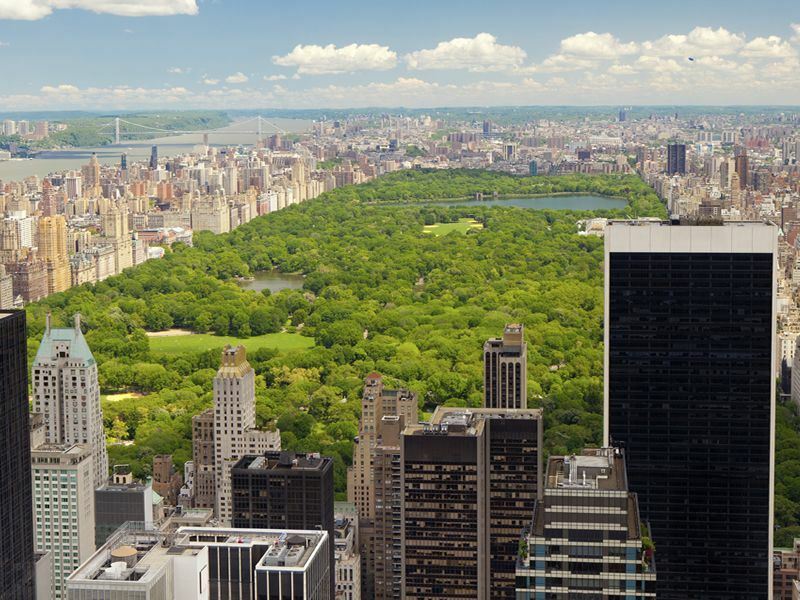 And finally, the main highlight of Central Park is the picturesque beauty of the natural green landscape and quiet escape that Central Park provides in one of the busiest cities in the world.